This snapshot of a handful of countries post-economic crisis shows one thing very clearly: a country’s ability to weather the economic crisis is related strongly to its level of modernisation or e-Intensity. Note: e-intensity is a measure developed by the Boston Consulting Group based on adoption, expenditure and use of the internet and e-commerce. Our analysis puts e-intensity against 10 year government bond rates as our measure of how well a country is weathering the economic crisis. The results of our simple analysis are particularly striking within the Eurozone. 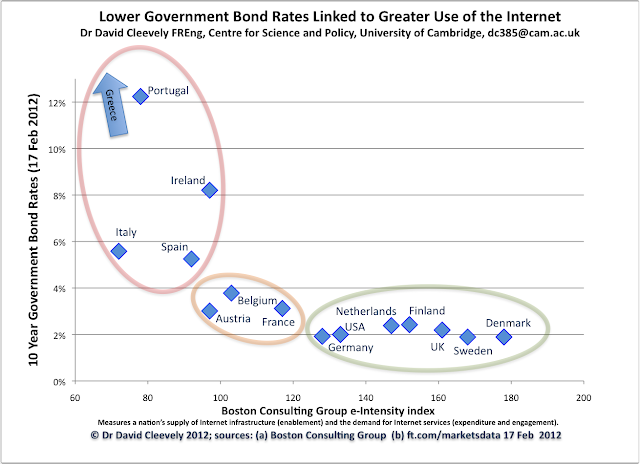 Member states which have not had the capacity to adopt and develop the internet and ecommerce are those with skyrocketing risk premiums on their governments’ debt. These states form a distinct group: Portugal, Italy, Spain, Ireland and Greece (which is literally off the scale) - all with high debt premiums and an e-Intensity score of well under 100. There are two other groups: those with high e-Intensity and low government bond rates such as Germany, Denmark and the UK, and a middle group (Belgium, Austria and France) with lower e-Intensity (100-120) and raised bond rates of 3-4%. a) Low e-Intensity indicates underlying structural problems: countries with high e-Intensity are those which have invested in modern processes, improved productivity and benefit from strong institutions. These are the countries that have lower borrowing costs, as they are best placed to grow their economies in the future. b) e-Intensity (or what it represents) is a fundamental capability: countries which use the internet intensively can respond more flexibly to shocks and crises, instead of being weighed down by cumbersome 20th century processes and institutions. What makes these two explanations compelling is the following: if you can get a country to invest in, use, and compete on the internet, then you must have either eliminated or minimised any underlying structural problems, or created a flexible and robust economy, or both. Five of the countries shown here (Greece, Portugal, Ireland, Spain and Italy) have been slow to embrace new technology, business models, and to change consumer behaviour. Much has been written about the institutional problems these countries face, but we think a very specific problem might lie at the heart of the current economic crisis: how do you get these countries to invest in and use the internet? And both investment and use are necessary – just buying infrastructure and fancy web sites won’t cut it. 1. Is the internet a line in the sand for Europe? Does a country’s ability to adopt and exploit modern technologies dictate whether it can operate within the single currency? 2. Can the problem be addressed in time? Does this highlight a structural issue that takes decades to solve, or is it a faster acting killer-policy-app for the Eurozone’s troubled economies that could keep them in the single currency for good? 3. Should investment in e-Infrastructure and stimulation of usage become a policy priority for Europe? We will answer question 3: “Yes, immediately”. Of course, further evidence is needed and linkages need to be demonstrated, but the risks are high and the expensive parts of the solution - infrastructure investment - can have well-calculated returns. Whatever the underlying mechanisms, it is clear that the internet is playing a very significant role in modern economies, and one which may extend far beyond its direct share of GDP. David Cleevely is Founding Director of the Centre for Science and Policy at the University of Cambridge. What do the figures look like when plotted against each of the 3 factors separately ? I suspect that this is possibly more about high-value infrastructure investment as a proxy for a high-value economy? I think it's a symptom if economic crisis. The market analyzer should analyse what the reason behind this crisis and should take necessary step to prevent this crisis.